You probably already know that 帽子 (màozǐ) is a cap or a hat. When it rains, you would put on your 雨帽 (yǔmào a rain cap or a hood). When it’s hot and sunny, girls may put on their 草帽 (cǎomào straw hats). 礼貌 (lǐmào) means politeness or manners. 有礼貌 (yǒu lǐmào) is being polite and courteous. On the other hand, 礼帽 (lǐmào) is a hat that goes with formal dress, such as a top hat. 军帽 (jūnmào) is an army cap. 脱帽致敬 (tuōmào zhìjìng) means to salute by taking off one’s hat. The unit for hats is 顶 (dǐng). With regards to clothing articles or ornaments, 戴 (dài) means to wear or to put on. Tā dài zhe yī dǐng màozi. He is wearing a hat. Please note that 戴高帽子 (dài gāomàozi) means to give someone gratuitous flattery. Nǐ bié gěi wǒ dài gāomàozi. Now, on to a well-known puzzle that calls for putting on your thinking cap. Three intelligent gentlemen are detained for some reason. Their captor agrees to set them free if they are able to solve a puzzle. He orders them to stand in a line, one behind the other, all facing the same direction, and to close their eyes. After placing one hat on the head of each of the three gentlemen, the captor lets the gentlemen open their eyes. 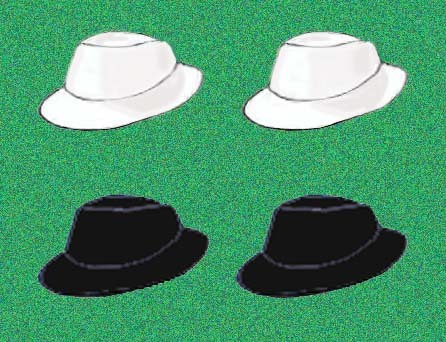 He announces that altogether there are two black hats and two white hats, and that the fourth hat is hidden in a closet. If any one of the gentlemen correctly guesses what color hat he is wearing, without looking in a mirror or communicating with the other two gentlemen, all three will be set free. Given that the gentleman at the very back can see what hats the two gentlemen in front of him wear, the gentleman in the middle can only see what the first gentleman wears, and the gentleman at the front cannot see what anyone was wearing, how do you suppose they will be able to resolve this dilemma? Wǒmén zhīdào yīgòng yǒu liǎng dǐng hēi màozi hé liǎng dǐng bái màozi. We know that altogether there are two black hats and two white hats. Yī wèi shēnshì zhàn zài qiánmiàn. One gentleman stands at the front. Yī wèi shēnshì zhàn zài zhōngjiān. One gentleman stands in the middle. Yī wèi shēnshì zhàn zài hòumian. One gentleman stands at the back. zuì hòumian de nèi wèi shēnshì jiù huì cāi dào zìjǐ de màozi de yánsè. the gentleman in the very back will be able to guess the color of his own hat. nàme biǎoshì qiánmiàn liǎng wèi shēnshì dài zhe bùtóng yánsè de màozi. then this indicates that the two gentlemen in front have different color hats on. suǒyǐ tā kěyǐ cāi dào zìjǐ de màozi de yánsè. therefore he will be able to correctly guess the color of his own hat. Sentences involving such word pairs as 如果 (rúguǒ) + 那么 (nàme), and 因为 (yīnwei) + 所以 (suǒyǐ), are complex sentences. Please review Chapter 25 of “Learn Chinese through Songs and Rhymes” to see how to construct complex sentences using the 5 W’s. Re. Nǐ bié gě wǒ dài gāomàozi. Lovely lesson. Quite interesting and a brain teaser as well. Hats off to you, Anthony, for being so sharp-eyed!